The third son and the eighth child of William Griffin Jeter and Elizabeth McCutchen Berry, William Thomas "Will" Jeter was born 10/19/1850 on the family farm between Petersburg and Atterbury in Menard County, Illinois and remained there until the age of six. In a letter to a cousin, Anderson Bell Berry, in August of 1921, Will recalls "Father sold the farm...outfitted with teams, wagons, etc. for and with (the) intention of crossing the plains to California and started on the first lap of the long trail soon after sister Harriet's marriage in 1857....It was the plan to stop a year in Missouri, the custom at that time, to get an early start across the plains in the spring. The removal from Illinois covered something over 200 miles to where father stopped in Livingston County near Chillicothe, Missouri. He was so well pleased with that part of the country that he bought land and improved the farm on which he lived until his death. [in 1867]"
Will was to remain in Missouri until 1876, the year after the death of his mother. In the intervening years he worked on the farm and began his education ...."[I] was educated in the public schools, attending an excellent grade school, with five or six members in the faculty"....and then later started to read the law and engage in business activities. Deciding to take a vacation from his business activities and budding law practice, Will headed west to see the sights and to visit with his uncle, Thomas Horatio Jeter, who had arrived in California from Illinois just prior to the Civil War. He stopped initially in Virginia City, Nevada and was caught up in the excitement of the silver strikes,but with the full intention of returning after a few months to his law studies and business activities back in Missouri. He did not return to Missouri, but pushed on in 1877 to California and Hastings Law College in San Francisco. 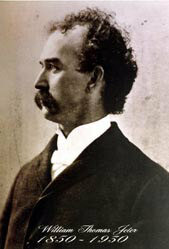 - be elected in 1884, and then twice re-elected district attorney in a heavily Republican county. - serve as a member of the Santa Cruz City Council and as the Mayor of Santa Cruz. 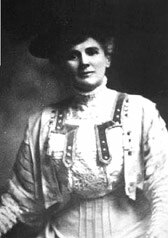 - accept the position of president of the Santa Cruz County Bank in 1893 and would hold that position for the next 37 years. - upon the death of the incumbent Lt. Governor, be named on 10/25/1895 as Lt. Governor of California and serve most of his term as "de-facto" governor because of the ill-health of Governor Budd. - be admitted to practice on 10/20/1908 before the Supreme Court of the United States at Washinton, D.C. The Governor passed away on 5/15/1930 ---- the telegram to brother Mayo read simply, "Your brother Will passed away today." His beloved wife, Jennie, outlived him by almost twenty-nine years and passed away 10 months shy of her 100th birthday in 1959, driving her buggy to town almost to the last. They both rest in the masoleum, corridor "B", crypt #54, of the Santa Cruz Memorial (IOOF) cemetery. "CLIFF CREST". Will & Jennie purchased their Queen Anne-style home on Beach Hill in the 1890s. It had been designed by D. A. Damkroeger in 1887 and would undergo several changes during the Governor's ownership. Major were the addition of Jennie's room, the circular solarium and a belvedere. 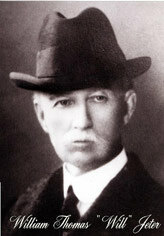 John McLaren, the landscape architect of Golden Gate Park in San Francisco and a personal friend of the Governor, designed the gardens for the Jeter home. Cliff Crest remained in family ownership until 1968. Since then it has been completely restored and is currently operated as a "bed-and-breakfast" by owners who have knowledge of and a great deal of respect for its history. 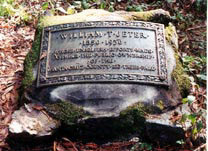 Inscription reads: "William T. Jeter, 1850-1930, whose unselfish efforts made possible the public ownership of the Santa Cruz County Big Trees Park." This tree is located in the Henry B. Cowell Redwoods State Park in Felton, California, a little north of Santa Cruz on the highway to Los Gatos.